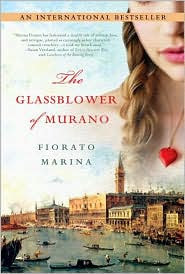 Already a bestseller elsewhere, Marina Fiorato's first novel, The Glassblower of Murano, is now being released in the United States. It is the story of a young woman who chooses to become a glassblower and then finds that an ancestor generations back was the premier glassblower in Murano, Venice. When Leonora's marriage ends, she decides to relocate from England to Venice and see if she can join the artistic community. When she arrives, bringing Corrado Manin's name with her, she gets both positive and negative receptions. Eventually Corradino is accused of having been a traitor to Venice and Leonora must fight to restore his good name and his place as a Venetian hero. Across the centuries, these two family members are dealing with some of the same issues of love, loss and betrayal. This was a very well researched and well-written first novel. It switches between the present of Leonora and the past, belonging to Corradino. Within these two time periods it was told mostly in third person but with some first person thoughts interspersed throughout the narrative. This really helped me relate to the characters and to care about them. Also, the Venice built by Fiorato is beautiful and unique. If you are tentative about reading historical fiction, this would be a good one to start with. Buy The Glassblower of Murano on Amazon or find it at your local library. Great review, I have always been fascinated with glassblowing. The color of the glass and shapes are so beautiful. i would love to read this book. Though there is only a small amount of the story dedicated to glassblowing, it was still enough to give a brief explanation of technique and the amazing skill of the master glassblowers. Yes, I think I would like it. I need to check the library.